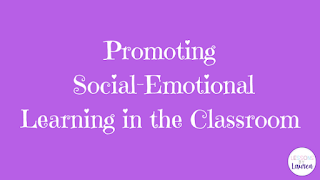 How do you promote social-emotional learning in your classroom? Or in your school? Or even in your community? It’s so hard to try to fit in all that we need to every day. Not only do we teach academics, but we also have to encourage emotional growth and teach kids how to work together. As a special education teacher, I frequently deal with kids with low self-esteem and who struggle to work with others. Some have very difficult home lives and have so much going on at home that it’s nearly impossible for them to focus on academics. However, I also only have my kids for 30 minute a day in my room. So, I have needed to find some quick, easy ways to promote social-emotional learning in the short time I have with them. 1. Create a theme of the month. At my school, we’re trying something new this year. Each month, we are focusing on a different theme to promote social-emotional learning. Teachers are able to do whatever they want with the theme, but all the kids in the school are hearing about the theme in their classrooms, around the school, and on the morning announcements. The discussion with the kids typically starts in their classrooms during morning meeting. You can do a quick chat with your students in the morning (or when they come to your room), and focus your discussions around that for the month. 2. Place posters around your room about kindness, empathy, gratitude, etc. 3. Have a daily (or weekly) prompt on your board (or on a wall, window, really anywhere you have room!) In September, my school focused on kindness. So, on my board I wrote, “What kind words have you used today?” Each day, my students would add a post-it to the board with something nice they had said to someone else that day (or the day before). 4. Create a chain and hang it in your classroom (or above the door, in the hallway, anywhere!) In November, we talked about gratitude. We talked about how we can be thankful for the people, things, and values we have. Each day, I had my students write “I’m thankful for…” on a strip of construction paper. For example, one student wrote, “I’m thankful for having food to eat.” Another wrote, “I’m thankful for having teachers to teach me how to read.” Some other examples included being thankful for family, friends, clothes to wear, a school, books, and health. I tried to steer the kids away from choosing toys since I wanted them to really think beyond fun items and belongings. Each day, the strip of construction paper would be linked to the others to create a chain. The chain is now hanging in my classroom as a reminder to the students about the many people, things, and values for which they are grateful. I only have my students for such a short time, so I needed this to be a quick activity – the first day or two took a few minutes, but eventually, the kids came to my room with an idea in mind and were able to finish it within two minutes of walking in! 5. Make cards (or pictures, ornaments, anything!) for someone in need. In December, we talked about generosity. I encouraged my students to think about how they could give their time and show kindness to those in need. So, they created cards for kids in our local area (and a few in other states) who are currently fighting cancer or other serious illnesses. My students were so creative with their cards and really were so happy to try to cheer up the other kids. 6. Create a kindness jar. On popsicle sticks, write different acts of kindness that the kids would be able to do (make sure it fits the ages of your students!). Encourage your students to pick a popsicle stick each week and try to do this act of kindness. For example, with my 3rd-5th graders, I would have popsicle sticks that say, “Open the door for someone else,” “Give a compliment to a friend or family member,” “Ask someone new to play with you at recess,” “Read a book to your younger brother or sister,” and “Help your mom or dad (or another grown-up) with making something (like dinner).” You really could write anything down, even encourage your students to help you make the list of ideas. 7. Have your kids set goals for themselves – this is a great activity for the beginning of the school year, January, or at the beginning of a marking period/semester. However, you can do it anytime! There really are so many ways to promote social-emotional learning in your classroom. What do you do in your classroom? !